Join us for three spectacular days of car camping at Pismo Beach and exploring the beautiful central coast. Located north of Santa Barbara and just south of San Luis Obispo, it's a short three hour drive from Los Angeles. We will be staying at the Pismo State Beach North Beach Campground, a developed campground with hot showers and restrooms, only a short walk from Pismo Beach. 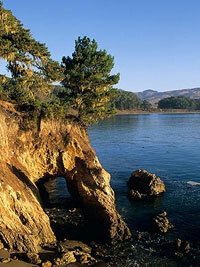 Although, we will camp at Pismo, we will also be visiting north to Morro Bay and San Simeon. And of course some greatfood as well!!! Activities include the following: Hiking Montana de Oro,kayaking in Morro Bay, wine-tasting touring of Hearst Castle (optional), viewing Elephant Seals, Hiking San Simeon Point, walking on the beach, hot tubing at Sycamore spa (optional), and exploring the surrounding area. Arrive at the Pismo Beach State Park North Beach Campground any time after 2 pm. Or come up early, and explore the town of Pismo – or walk down the beach. First timers to seasoned paddlers, explore 15 miles of protected waters in the beautiful Morro Bay Estuary/Bird Sanctuary. Morro Bay is composed of 2300 acres of mud flats, eelgrass beds, tidal wetlands and open water. Two dozen threatened or endanger species live in the area including the Peregrine Falcon, Brandt Goose, Brown Pelican, Sea Otter and Snowy Plovers. Morro Bay is a major West Coast wintering area for over 100 species of birds providing year around bird watching opportunities. 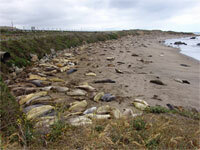 Its waters are home to California Sea Lions and Harbor Seals, which use the mud flats as a hauling out area. Many type of marine invertabrates and fish are also abundant in the bay. The sand spit, which forms Morro Bay, is an excellent place to walk among the dunes, beachcomb, picnic or simply enjoy the solitude of over five miles of quiet beach. Easy flat-water access from our dock coupled with the abundance of nature make Morro Bay. The Montana de Oro State Park hiking trails are just beautiful! This park features over 8,000 acres of rugged cliffs, secluded sandy beaches, coastal plains, streams, canyons, and hills, including 1,347-foot Valencia Peak. The Bluff Trail is a wide trail traveling along the coast with several single path trails branching of the main trail so you can get a closer look over the bluffs. This is a very easy hike with lots to see. Gofers, rabbits, seagulls, and even rattlesnakes call the bluffs home. The parks name “mountain of gold” is fitting with so many golden wildflowers. The costal view from the trail was amazing and the rock formations below the bluffs will definitely intrigue you. The San Simeon Bay Trail begins at William R. Hearst State Beach along a crescent of white sand. The hike leads to the tip of San Simeon Point, a beautiful peninsula extending a half mile into the ocean. At the point are beach coves, dramatic rock formations and tidepools. The trail follows the bluffs through a beautiful forest of eucalyptus, pine, cedar and cypress trees. The Northern Elephant Seal, Mirounga angustirostris, is an extraordinary marine mammal. It spends eight to ten months a year in the open ocean, diving 1000 to 5000 feet deep for periods of fifteen minutes to two hours, and migrating thousands of miles, twice a year, to its land based rookery for birthing, breeding, molting and rest. The Piedras Blancas rookery, on Highway 1 seven miles north of San Simeon on the California Central Coast, is home to about 17,000 animals. The area is open for viewing every day of the year. Enjoy the morning in Pismo and drive home. Andrew Photos from Pismo beach trip. Campsite, all meals from Friday night happy hour through breakfast Monday morning.